1. TO – Recipient could be checking only if they are in To and their name is in To. Make sure both are properly filled. 2. CC – Make sure to cc person one level above who is responsible. cc your manager and other party manager should be done. 3. Have your signature in the end, so recipient is aware who is he talking to and where to contact for follow-up. If your company has a signature template, follow that. 4. BCC can be dangerous to use in case of mistake. Review mail content properly when want to use it. 5. Content should be clear, concise, simple language. 6. Use bullets or numbering if multiple points are being discussed. 7. Do not use heavy vocabulary, local language or slang. 8. Be polite in content. Tough message should be given out diplomatically, make sure you get those reviewed as words can appear more angry than your actual message. 9. Read your own mail before clicking Send. If required, get it reviewed by your senior or peer. Check who all are in cc before clicking Send. 19. If you are committing a date, its your duty to follow-up internally and make sure delivery happens by that date. Or communication is done to client for the delay. 21. Before finishing your work day, make sure all client emails have been responded to. Any action required on those have been taken care of. 22. Early morning, login and clear any pending mails. 24. 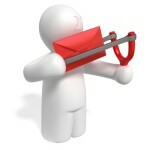 To properly manage emails, you can keep mails Unread on which you need to respond bit later. 25. Use Labels, Filters as appropriate, simple features help manage mails easily.